In June 2018, DatapointLabs Technical Center for Materials became part of the Applus+ Laboratories organization. The Applus+ Group is a global leader in the testing, certification, and inspection sector. The Applus+ Laboratories division provides services to various industries, notably aerospace and automotive markets. "Joining with Applus+ presents a strong synergistic opportunity for DatapointLabs to scale our services and software to a global audience of companies working with new materials, novel manufacturing processes and simulation-driven product development." This expanded global network allows both companies to offer a wider range of services to their combined customer bases. "Thanks to the integration of DatapointLabs, we continue to expand our service offering to industries with high technological value. The combination of laboratory tests with numerical simulation provides a key tool for our customers to optimise their products from the moment of conception," said Jordi Brufau, Executive Vice President of Applus+ Laboratories Division. SPE Automotive TPO Conference, October 7-10, 2018; Troy, MI USA. Find DatapointLabs in Booth 24. Digimat Users’ Conference, October 9-11, 2018; Prague, Czech Republic. DatapointLabs is a Silver Sponsor. CADFEM ANSYS Simulation Conference, October 10-12, 2018; Leipzig, Germany. Find DatapointLabs in the exhibit hall. Global Altair Technology Conference, October 16-18, 2018; Paris, France. DatapointLabs is a sponsor; Matereality Workgroup Material DatabasePro software is available through the APA. Attend our presentation, A Framework for the Calibration and Validation of Multiscale Material Models , in the Material Engineering track on October 18. NAFEMS France Regional Conference, November 14-15, 2018; Paris, France. Find DatapointLabs in the exhibit hall. Failure models are increasingly being implemented in structural analysis, particularly for dynamic applications. Advanced testing techniques are needed to obtain failure data as a function of stress triaxiality. DatapointLabs has now expanded the range of tests needed to explore failure of metals and plastics. The data is used in GISSMO and SAMP-1 material models implemented in LS-DYNA software, as well as equivalent material cards available in SIMULIA Abaqus and Altair RADIOSS software. Biaxial testing of metals is commonly performed using an Ericssen Cupping Tester, an apparatus designed for generating forming limit diagrams (FLD). By combining this instrument with 3D digital image correlation (3D-DIC) it is now possible to obtain such biaxial data for use in failure modeling. Force v. surface strains are measured. This test is available as part of the G-776 GISSMO material model. A wide variety of shear tests are indicated for the characterization of failure of metals. A prime application of these tests is with sheet metals, which are used in automotive structural applications. The highly specialized tests yield data at different stress triaxiality states, providing valuable data points for failure models such as GISSMO. 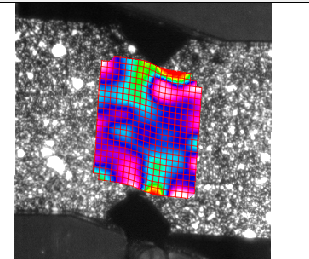 Digital image correlation is a key tool to obtain localized strain data for these different geometries, providing the necessary accuracy required for these tests. A variety of geometries are available to produce the desired end results. DatapointLabs has collaborated with Altair Engineering to develop a new TestPak for calibration and validation of multiscale material models used for the simulation of structured composites. These models are increasingly important in simulation-driven workflows involving composite materials and structural analysis. Using these models, it is possible is to predict the performance of layups from single layer properties, as well as performance of these composites under complex loadings, including failure. A technical presentation of joint development work by is being presented by co-author, Megan Lobdell, at the 2018 Global Altair Technology conference in the Technical Presentations, Material Engineering track. Review the pre-print of A Framework for the Calibration and Validation of Multiscale Material Models on Knowmats.com, the curated knowledge repository for materials in simulation. DatapointLabs now offers an expanded range of composite testing as these materials enter the mainstream in automotive businesses. The range of materials include uni-directional (UD) laminates and thermoplastic tapes, woven composite layups, as well as chopped fiber thermoplastics and SMC. In addition to classical experiments for tension-compression and flexural loadings, four point bending, compact tension tests are now available at a variety of environmental exposures, including Cold Temperature Dry (CTD), Room Temperature Dry (RTD), or Elevated Temperature Wet (ETW) conditions, as well as tension tests up to 100 /s strain rate with sub-size specimens. Open-hole tension and compression (OHT/OHC) tests and Iosipescu shear tests are accompanied by digital image correlation (DIC) imaging for highly detailed analysis of composite failure. Autoclave facilities are also available to prepare composite layups for testing. The scope of testing in the additive manufacturing space now includes tests on both plastics and metals. For plastics, viscosity tests are available for strand and powder materials. Mechanical properties of metal and plastic lattice structures can be measured in tensile, compressive, flexural and shear modes for exploration and model development. Through the use of DIC, detailed information can be obtained for the validation of simulation models. DatapointLabs now offers high temperature metals testing in collaboration with Applus+ Laboratories. The expanded scope of metals testing includes high-strength tests, room temperature and high-temperature high cycle fatigue, high temperature creep and fracture mechanics testing, with more to come. Please contact us for details.